Note: Pick the right network for your Plan. Best to Call TelaDoc first for Concierge service. Click Button on right, follow instructions below on new window. Click "Search by Doctor or Facility"
Click "Search by Plan or Selecting a Network"
Hopefully your doctor shows in the Anthem Pathway HMO Network. No out of Network Coverage except Emergencies. 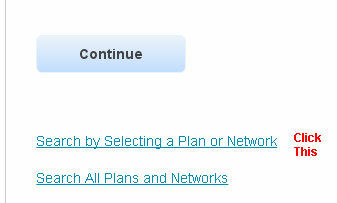 Click the pink button under Select Plan, Pick Medical Plans. Select ''Connect Network" and then hit the pink "Choose" button. If your Doctor Shows up He/She should be in the Cigna Connect EPO Network. This is an easy one, Pick "Find Doctor" or "Find Facility"
Click on Doctor...Networks View Details... make sure they take individual Plan. Use this website to research Doctors, many of these Doctors may not participate in the quoted ACA Individual plans . Great way to get the Doctors name and address.